OK, it took me longer than I thought it would to sort through signatures and get the petition ready to be sent in. We had intended the petition's ending date to be the 1st, but it took me till the 6th to have to ready so we continued to collect signatures until then. It's officially over now, and I've sent it in (snail mail) to FUNimation...they should recieve it on Monday or Tuesday. We'll see what happens! Our total valid signature count was 4639. About 340 were fake, inappropriate, or duplicate and were removed before the signatures were printed out. We had about 150 pages of signatures! I sent them in a 3-ring binder along with the petition text and a letter of introduction. We also included our "voice actor attachment" which was a suggested cast list involving the actors from Ocean group. We decided not to include the music attachment however. Thanks to 3 other members of our petition "team" who helped out: William Ben Newton, Ben Leach, and Charles Parker. Also thanks to all the sites who linked to us, and of course to everyone who signed the petition. I'm glad there are so many great fans out there. That's about it...also I trimmed down the site a bit. Now that the petition is over, we don't need so many sections. Just this and the main page. Happy New Year! The petition officially "ended" yesterday, but I won't get it ready to send in until Friday probably. You can still sign it until then. Thanks to everyone!! Also, I added one more site to our list. 2. Send me an email with your name, age, and location and I'll sign for you when I can get through. Added a banner and took out the poll--I think we got enough info. Thanks to everyone who participated. Wow...a whole month of...nothing happening. We still don't know what's up with the Oean Group, so at least for now, the VA part stays in the petition. Also, we're starting something new--a letter writing campaign. This is not a part of the petition; it's a seperate endeavor. 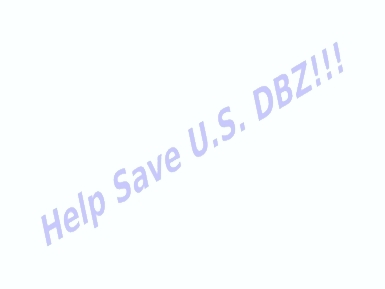 Please take the time to check out the campaign and send a letter in to FUNimation. It'll only cost you 33 cents for a stamp...what excuse do you have? If you write your own letter, please remember to be polite. And if you're incredibly busy, you can use our form letter...what could be easier? Also I'm trying to make a banner for this site. It should be done soon. Also I added 2 new links...I can't get banners to work though for some reason. I also got rid of the "summary of the petition" section, since I don't think it's really necessary and might just confuse people. It was my idea originally so I figured no one will care if it's gone...if I was wrong just tell me. Our webpage moved here to tripod, and I'll be updating it from now on. Our old URL still works but links here. Um...that's about it. We're working on a letter writing campaign. Also sooner or later we're going to send a letter in to FUNi telling them about our petition...something we should have done a while ago, but we weren't quite ready. Also I took away the Planet Namek link since they aren't officially linked to us...and replaced it with another. If anyone has a site linking to us and we don't mention it, just email me. The petition has been a very controversial issue lately. Some argue that it asks for too much, some say its just what we need. Because we want to represent the true intent of the fans, I have just put up three polls. Each poll asks whether or not you think the petition is asking for too much, what you want to see happen to the dub the most, and whether or not you think they have improved. Please vote in them, as you will help us represent the fan in a much truer sense, and if need be, we can modify the petition to accomodate just such a thing. We need your input! Vote in the polls! PS, I'll be away from the 21-31, so please dont email me during that time. Well, well well! Chris Sabat, voice actor, and voice director at FUNimation has read our petition! We have been assured that Chris is trying to pull some strings up at ol' FUNi and help make our petition a reality! Thanks Chris! Anything you can do, that will help will be appreciated by all of us. Thanks so much for your effort, your tolerance, and your willingness to help. And thanks to all the people out there who helped get our voices heard. You just helped out in a very big way, and on behalf of all of us, we thank you. Well, the big PN finally mentioned us in an update. We realize that we are stirring up quite a bit of controversy on the whole redubbing issue. Well, did you know that any redubbing comes from Pioneer? Pioneer owns the release rights to the first two seasons, and they have told us that any redubbing, or subtitling of these episodes will be from them. This is a tough issue to tackle, and your feedback will be taken into consideration. Keep in mind that I am not the sole writer of the petition, so, if you would like to talk to the other writers about your feelings about a redub, please visit our message board at http://disc.server.com/Indices/113579.html. Please be mature. You'll be taken more seriously. Added to the Why Sign? page, and added a few more links. Folks, if you want to link to this site, please tell me! I can't magically link to you, if you dont e-mail me first. Also, I'm very strict with linking. I dont promote page piracy, so If I didnt link to you, its either because you never e-mailed me, or you have something that another site has, be it images, layout, or information. If you want to be linked, then take the stolen stuff off. Just a tiny update. I fixed some minor fonts on the site, so its just a bit more organized. I also added a credit to another writer of the petition who was MIA for a while, and added our contact addresses to them. Out. Although this site was first put up June 22, its hasn't really been "born" until a few days ago, July 14. Up until that point, we only had roughly 120 sigs. Now, the number's quadrupled in a matter of days!! (I guess linking with Greg Werner did the trick!) Thanks for all the support guys!